WeBuyUsCoins.com was established to buy coin collections that you want to sell for CASH. 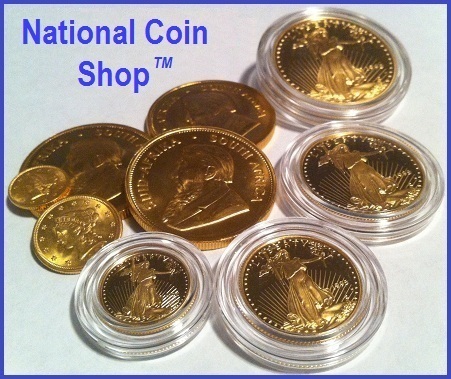 We buy all kinds of Coins, Silver Coins (1964 & older dimes, quarters, half dollars and dollar coins), American Silver Eagles, American Gold Eagles and more for CASH. We buy entire coin collections or a single gold or silver coin. We'll come to your home, office, public library or local bank to complete an appraisal of your silver coins, gold coins or entire coin collection. We'll explain and show you our documentation for the value of your coin collection before we give you an offer for your coins. For American Silver Eagles in uncirculated condition we pay 100% of "Spot" (the current price for an ounce of Silver) and more. We pay even more for proofs and professional graded American Silver Eagles. We buy other silver coins, too! We buy one ounce "silver rounds" as well as other larger minted silver coins and silver bars. For ordinary U.S. Silver Coins made in 1964 or before, we pay about 10 to 15 times the face value of the coins based on the current price of silver (that's about 70-80% of the "melt value"). And even more if it's a "proof" or in mint condition! When you're thinking: Who gives cash for Silver?, Where can I sell my Silver?, or Who buys Silver in Indy, Indianapolis, Carmel, Fishers, Zionsville, Castleton, Noblesville, Lawrence, Brownsburg, Beech Grove, Speedway, Greenwood, Mooresville, Plainfield, and Central Indiana? We'll come to your home, office or local bank to complete an appraisal of your coins and more.